"You watched a movie. You knew it wasn't very good. But you loved it anyway." 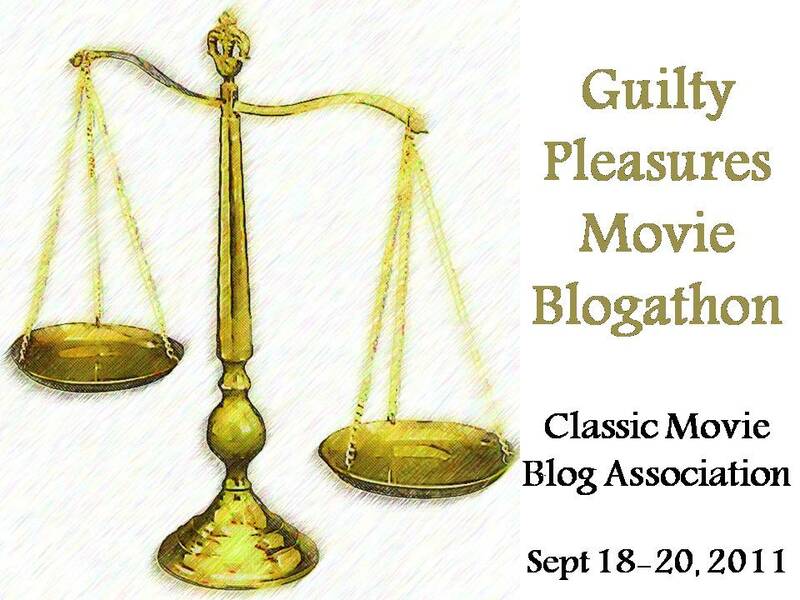 From September 18 - 20 the Classic Movie Blog Association pays tribute to those guilty pleasures with a movie blogathon. When I was a kid in what I recall as the sunny sixties and The Greatest Show on Earth came on television, it was an event! In my eyes, it was the most glorious movie. It was big, bold, emotional and exciting. Brad was such a good guy. Sebastian was so charming. Klaus was so bad. Angel was so interesting. Holly was so brave. Buttons was so wonderful. Oh, Buttons was the most wonderful man in the world. When I was a teen in the seventies I started reading everything I could get my hands on that concerned the movies including those Best and Worst lists. There it was, time after time, in black and white, "worst Best Picture Winner of all-time" into perpetuity, The Greatest Show on Earth. Why? Apparently, because The Greatest Show on Earth was big, bold, emotional and exciting. Only the words were changed to corny and overblown. While my affection for the movie never changed, guilt and shame wracked my heart. The Greatest Show on Earth was no longer a movie celebration, it was something to be watched on the sly. 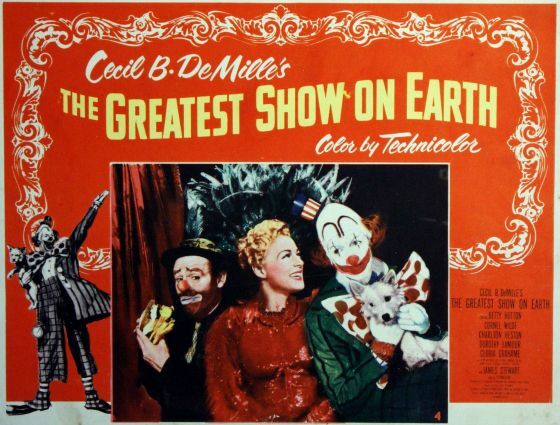 In 1950 as Cecile B. DeMille neared his 70th birthday, he felt the desire to run away and join the circus. He spent months with the Ringling Brothers Barnum and Bailey Circus at their Winter quarters in Sarasota, Florida learning all he could about the operation of a circus. He studied the people who populated the big top; their way of speaking, the way they come together year after year as a troupe of traveling players. Perhaps only DeMille with his expertise in big pictures could relate to that same grandiose quality in the circus and have the guts to tackle the logistics and complications of the location shoot which would not only give his film the air of authenticity he experienced but capture for us all a passing way of life. The Greatest Show on Earth was not only honoured by the Academy with the Best Picture Oscar and Best Writing, Motion Picture Story, it received nominations for Costume Design, Color, Best Film Editing and Best Director. The Greatest Show on Earth was also the Golden Globe winner for Best Motion Picture and won Best Director and Best Cinematography, Color. Cecil B. DeMille was one of 18 directors nominated by the Director’s Guild that season. DeMille was making a circus picture. Hollywood was filled with lots of folks with a desire to run away and join him. Jimmy Stewart called. He’d always wanted to be a clown. 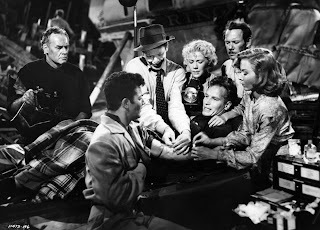 “We have Stewart,” DeMille told his staff. “He wants to be a clown.” Jimmy’s clown, Buttons, would be the heart and soul of the story. Jimmy Stewart helped to create his own clown makeup for Buttons. He was helped by Wally Westmore but had the final decision. 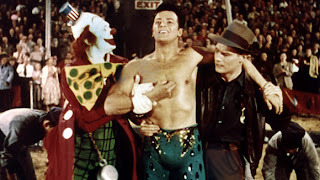 He also learned routines and worked with the best including International Clown Hall of Famer Emmett Kelly and the man known as King of the Clowns, Felix Adler. Gloria Grahame took on the role of Angel, a circus temptress with a heart of gold. I think she deserved a medal for some of her stunts with the huge animals. The girl had guts. There is not one man of my acquaintance who doesn’t look at the Oscar-winning (The Bad and the Beautiful) actress and turn into Bert the Cop. There’s always an exception to the rule and in The Greatest Show on Earth, that exception is circus manager Brad Braden played by Charlton Heston. He’s not immune to ladies, after all, he has a thing for trapeze artist Holly, but the circus comes first. He has sawdust in his veins. Where's my hat, you damn dirty ape? Heston was driving off the Paramount lot one day and stopped to wave at DeMille. DeMille had met the young actor in the studio dining room once. His secretary reminded him of the actor’s name and the movie he had screened, The Dark City, and hadn’t liked. “Umm, I liked the way he waved just now. We’d better have him in to talk about the circus manager.” The big thing about Brad was choosing the hat. DeMille told him “Shoes don’t matter so much…usually, you don’t even see them. But if you wear a hat, it’s in every shot, and featured in every close-up.” They looked at dozens before the right hat clicked, but click it did. 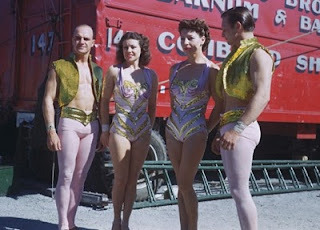 Genuine circus performers such as The Zoppes Equestrian act, The Flying Concellos and The Alanzas of the high wire are featured in the film and the cast was expected to fit in. Dorothy Lamour learned her iron jaw act. 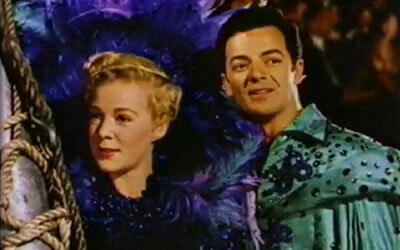 Olympic calibre fencer Cornel Wilde and energetic Betty Hutton worked hard to look plausible on the trapeze. Cornel was doubled in some scenes by aerialist and clown, the son of circus performers, Jackie LeClaire. The bubbly Hutton was also a woman of fragile emotions, and she found in DeMille a supportive and understanding director. The role of Birdie, the circus costumer, was one of the better ones bestowed on Julia Faye. At one time DeMille’s mistress, she appeared in all of the pictures after that relationship ended. 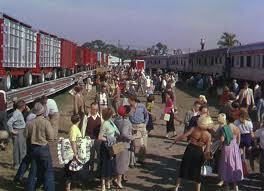 Our movie follows the fortunes of The Ringling Brothers, Barnum and Bailey Circus from the opening of their season. As long as the manager, Brad, can keep the finances in the black they can play a full tour including the smaller cities. A gangster played by top movie scary guy Lawrence Tierney plants John Kellog with a crooked sideshow game on the lot to mess up the works and cheat the rubes. He’s got plans to take over. Another guy with plans is elephant trainer Klaus played by Lyle Bettger (Has anybody ever seen him play a good guy? ), but as his plans involve pretty Angel and her plans involve Brad…well, you can see trouble coming. Brad’s girl, Holly is distracted by fellow flyer Sebastian. First, she wants his centre ring and then she’s not so sure it isn’t something more personal. Buttons the perpetually made-up clown is a doctor on the run. He killed the thing he loved. (Oh, heartbreak!) All of this angst and intrigue is but a background to the day to day work of putting up, taking down, and putting up again the greatest show on earth. The movie is the circus. The real audiences caught coming and going are moments in time that are a joy to share. Those Hollywood folk who didn’t get to be clowns or barkers like Edmund O’Brien, got to be spectators. It is especially fun to see Bing Crosby and Bob Hope as their Road picture comrade Dorothy Lamour does her stuff. William Boyd as Hopalong Cassidy leads a parade. He first worked for DeMille in 1927's King of Kings. Among the spectators, it is fun to spot or try to spot many favourite character actors including Kathleen Freeman, Mary Field, Dorothy Adams, Clarence Nash, Arthur Q. Bryan, Stanley Andrews and Peter Hansen. Pretty leading lady Nancy Gates makes an impression. Yes, that is her. You’ve been right all these years. This poster simply screams "melodrama". I love it! Hey - it's an Oscar winner - don't feel so guilty. While it might be politically correct to malign, the people know what the people like and they liked this movie. It's pretty hard to argue with a cast like that and, in 1952, it was "The Greatest Dhow on Earth" as only CB could orchestrate! Great post, CW! "Where's my hat, you damn dirty ape?" I'm getting a little too old to be falling on the floor laughing this early in the morning. I loved this review. 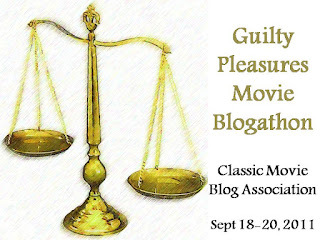 I agree that "guilty" pleasures is a misnomer for a lot of us film buffs who are impervious to guilt when it comes to these movies. One of my favorite parts of this movie is looking for well-knowns in the audience. I love the circus, and though the high drama of the main characters is intriguing, I'd be just as happy if this were a documentary about guys who hammer in the tent spikes. I just like the cirucs. Of course, DeMille loved train wrecks. I wonder if anybody ever did a count of train wrecks in his directorial career? I love this movie! Everything about it keeps me watching it no matter when it is on. I love it - and I am not guilty for liking it. I'm sure not guilty about a film with Gloria responding with the line "to Brad waiting to bite something with "Well pick your spot"" How did that get by the Hayes office? Caftan, some people just don't know quality when they see it. LOL! Just the pure logistics of this film make it something to behold. Cecil B. De Mille was the master of this type of film, and who really doesn't like to watch a spectacle? Loved Stewart as Buttons the Clown. What an interesting pick--and there's no need to watch it on the sly anymore. I always liked this one too. I always thought DeMille got his Best Picture Oscar out of gratitude for a long and distinguished career. I can't remember specifics, but I recall there were many technical innovations created from this film. I can see you now as "The Baby Eve" sitting in front of the TV falling for Buttons. Isn't it funny how a little thing can have huge consequences? Heston may have owed his movie career to that simple gesture. FlickChick, it's a sign that the snobs have taken over when something so unabashedly entertaining as "The Greatest Show on Earth" is derided. I will not let them win...well, I'm working on it. Jacqueline, I'm so glad to have given you that chuckle. I was like Red Skelton laughing at his own jokes when I typed that one. If only DeMille had been one of those fellows who filmed his film for a DVD behind the scenes extra. It would have been fascinating - but with a little train wreck. DLobosco, "The Greatest Shows on Earth" is one of those movies that is hard to leave once you stumble upon it. You tell yourself you will just wait till this scene or that scene, but you know you're in for the long haul. Aha, Paul2, you are like my late father. Gloria was always referred to as "Gloria baby". The only other actress I heard him confer that title on was Susan Hayward. Kim, it's all out in the open now. My guilt is expunged. It amazes me how easily some dismiss this movie not even taking into account the enormity of the planning and work it took to pull the whole thing together. Kevin, whatever the reason or reasons behind the Academy Award, it was deserved. Here we are, entertained by it still. I love this movie even with some of its outdated special effects. Cecil B. deMille, really made the film work with plenty of suspenseful moments. A wonderful pick for a guilty pleasure. CW, I must admit to being guilty of never watching this film. I’m sure this oversight was not prompted by a mistaken sense of snobbery: I’m a big fan of both Gloria Grahame and Jimmy Stewart, and I absolutely adore Betty Hutton. I have a weakness for soap opera spectaculars; I simply don’t recall making a conscious decision to watch or not watch the film. The background information, inside references and your personal asides are hilarious, and certainly have me curious to watch what seems an unfairly maligned DeMille extravaganza. A film might be a guilty pleasure, but if it has the ability to transport us in memory to our childhood self, with little suspension of disbelief, this boarders on an art form. Caftan Woman, I hope you won't think badly of me if I admit that although THE GREATEST SHOW ON EARTH is better than it gets credit for (it's a sad day when an Oscar-winning film has to defend itself :-)), and the cameos were as fun to see as the stars themselves, I'm still happy that THE QUIET MAN won Oscars that year for director John Ford and Best Cinematography. Sorry, but we of Team Bartilucci just can't help loving that ...MAN! :-) Great post; your affection for ...GREATEST SHOW... really shines through! This was an excellent review: informative, fun, and affectionate. I haven't seen the film, but I'm going to. I'm going to dig through Scott Eyman's fantastic DeMille biography and pick a relevant quote. "As film critic Michael Sragow has noted, 'see him at the right age, and the size and the velvet artwork skies and yes, even the self-importance will stay with you for the rest of your life.'" I wish I'd thought of "The Baby Eve"...love it! This certainly was a fun choice for the Blogathon. 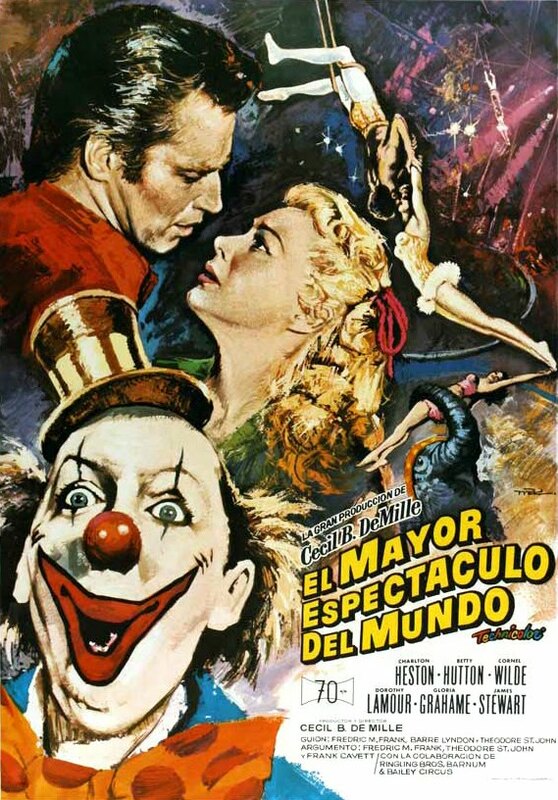 I love Betty Hutton and of course Stewart (Buttons always brings a smile to my face like everyone else) He makes it perfectly okay to like clowns. I had no idea that DeMille spent time with the Ringling Bro's, getting his inspiration that way but his research, experience allowed him to create a film that deserved it's accolades. Paul, you made my day. Thanks a lot, Dawn. It is a lovable movie, isn't it? Whistlinggypsy, you have said a lot about the draw of this movie for a lot of us, the ability to transport us to a cherished childhood memory. I believe "The Greatest Show on Earth" will still be able to work its magic for you on your first viewing. Dorian, would you believe that my husband had never seen "The Quiet Man" before he met me, but he now knows the movie verbatim? No, it is not a mirage brought on by my terrible thirst! Yes, Rachel, that quote nails it. Let me hear from you when you fall under the spell of DeMille's big top. Thanks for the kind words. Consider The Baby Eve yours, my friend. Thanks a lot, Page. Perhaps DeMille's peers' knowledge of what went into the film had a lot to do with the choice to award the film. Another delightful review, full of great background info and your personal reflections on the film. I think GREATEST SHOW gets criticized because it won Best Picture. OK, maybe it didn't deserve to win that honor...but that can be said of a lot of other movies, too. It's not a great film, but it always hold my attention. 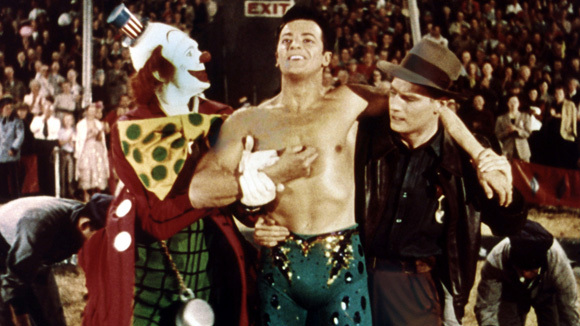 There just aren't enough movies set in a circus, which serves as a great microcosm of society. Lyle Bettger was pure evil. Ha! I loved this post. I've enjoyed this movie in the past too. Though I don't love it as much as you do, C.W. I still think it's a helluva movie. I'm sure my local theatre ran 'The Greatest Show on Earth' as a Saturday matinee, when I was a kid in the sixties. I remember watching it eating a really big bag of popcorn. Popcorn and this movie were made for each other. Sitting in the dark with that huge screen full of colour and excitement. All the people gasping and amazed at what they were watching. Wow, I'm #33 in line here! Well, that's OK -- DeMille would be thrilled to see an epic number of comments! I LOVE DeMille. I LOVE Greatest Show on Earth. I'm not ashamed, I don't feel guilty, I adore DeMille and all of his epic stuff. Yes, Greatest Show can be cheesy and melodramatic, but boy is it fun! I love that you feel the same way at heart! 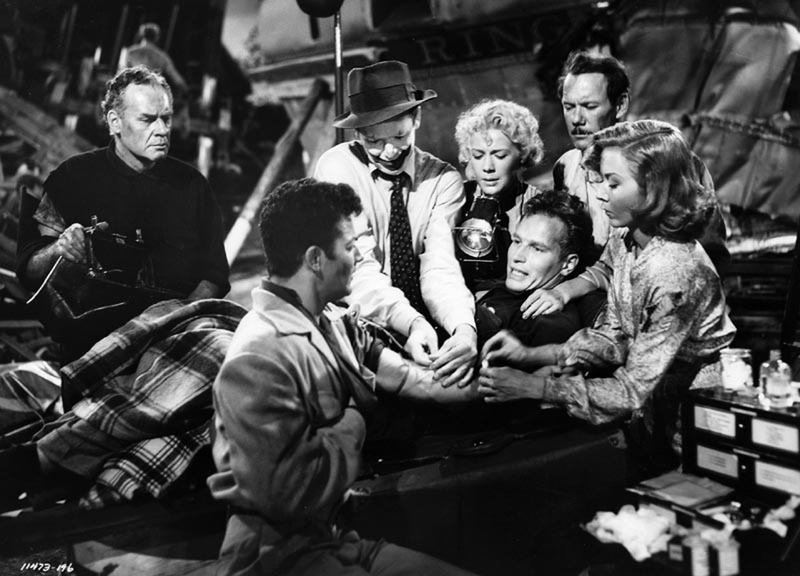 Charlton Heston is his usual pompous stuffed shirt but such a manly giant, Cornell Wilde his charming best, Betty Hutton Miss Dynamite, Gloria Grahame just fabulous and James Stewart -- well, just marvelous. CaftanWoman, part of the reason I love DeMille, besides his bigger-than-life movies, is for one of the reasons you mentioned -- he was always loyal to those who worked for him, from his silents on. He always had a job for them. I haven't read all comments, and I don't know if anybody mentioned it, but when he made the Ten Commandments and made bucco bucks, all of his profits were divided among while whole cast and crew - he kept none for himself. How can you not love a man who is epic in his own right? 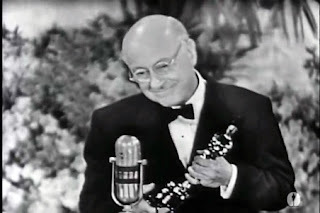 OK, my funny favorite of the article was DeMille saying to Desi: "Congratulations, Desi, you are the only person in the world to screw Harry Cohn, Columbia Pictures, Paramount, Cecil B. DeMille and your wife, all at the same time.” And my funny favorite of your own wonderful writing: "Ooh, it’s good stuff. Yes it is. It’s good in the way a banana split is good. A banana split with extra whipped cream. Extra! Why, I feel no more guilty about watching The Greatest Show on Earth than I do about eating a banana split with extra whipped cream. And I don’t feel guilty about the ice cream. I don’t. Well, I used to…well, not always…not every time..." My own feelings exactly. Good stuff, CW! It's true that the circus is a microcosm of society and funny that we think of it as a place to run away to. Yvette, I cannot think of one time where I ever saw Lyle Bettger play a straight up, honourable fellow. Not one! He always looked like he was having a good time though. Novabreeze, I am certain that if DeMille could read what your comment he would nod his head and say "she gets it". Becky, I appreciate your kind words. I did not know about the profit sharing for "The Ten Commandments". Mr. DeMille was an indeed an intriguing fellow. He made as strong an impression on those who knew him as on the entertainment industry. Paul, it's nice to think of Jim Henson and Frank Oz as being folks just like us - old movie fans. Paul and Caftan Woman - I forgot about Ward Bond as Bert the cop. I was actually doing a lame joke, thinking that Bert the cop must be from Car 54, Where Are You, that everybody was raving about with Iva's TDOY post about it. That's why I said "evil laugh". I think you like Car 54, don't you Caftan Woman? I thought so, so I thought I'd goad you a bit. If my memory is rusty and wheezing (like an old car), then the whole joke is a wash! LOL! Becky, I thought I detected a "Car 54" dig in there, so I chose to...actually, I was trying to come up with a pithy comment and, well, couldn't. I believe I threatened you with some sort of voodoo ceremony to sway your mind toward the men of the 53rd and their ladies. Yes, I did. Although, he doesn't realize it, Ivan's posts were part of my diabolical plan. Yes, they were! Bwahahaha. It's not working, is it? Your heart is still hardened against us. I'm not sure if Bert would have fit in with the guys or if they would have driven him nuts. H'mm. Anyway, it seems he was a really nice guy in real life. He stayed married to the same woman and generally was liked by everyone he worked with. CW, so far your voodoo as far as Car 54 has not worked -- if you have not already, head over to Grand Old Movies' blogathon post about Voodoo Woman with Bela Lugosi. Maybe you can pick up some better tips there. Believe me, it would have to be some strong ju-ju! LOL! Yvette, I so enjoy hearing about Bettger's secret life as a sweetie. I am taking to heart the instructions in Grand Old Movie's post. Wait till you see me made up like George Zucco. If nothing else, I'll frighten you into liking "Car 54, Where Are You?". Ooh Ooh Francis, I've fallen into a running Car 54 gag. Calm down, Gunther. You getting hysterical. GREATEST SHOW ON EARTH was *not* the worst film to win a best picture Oscar (that honor belongs to the boring AROUND THE WORLD IN 80 DAYS), but it's a lot more fun than many other pictures that did win. Fantastic post on this film and on the great DeMille, whose films are always a wonderful guilty pleasure. The circus atmosphere is great in this film; DeMille always did his research when he made his movies, and it shows here. I haven't seen this is a while, but your review makes me want to get out a copy and see it again! Okay...everybody maligns The Greatest Show on Earth as one of the worst Best Picture winners of all time--which isn't really fair. The history of the Oscars is larded with films that should have won but didn't...not to mention movies that didn't even get nominated. I don't think Greatest is a bad movie at all -- it's darn entertaining, and besides as long as there are prints of The English Patient still in existence it can't be considered the worst. In summary: The Greatest Show on Earth cannot be all bad by reason of the fact that Gloria Grahame is in it. And any film with G-L-O-R-I-A present is a pleasure period. On a related topic, the second season of Car 54 is scheduled to hit stores in February of next year...according to a pal of mine with The British Phil Silvers Appreciation Society. And as God as my witness, I will get Becky a copy of the first season set (with funds from this Saturday's bake sale) and make her watch it if it hairlips ev'r-body on Bear Creek! N-O-O-O-O-O-O-O-O-O-O!!! Help me someone! Isn't there any other voice of sanity and reason out there who DOESN"T like Car 54? Who could ever have dreamed that this thing would keep following me around like a stray dog with the mange? 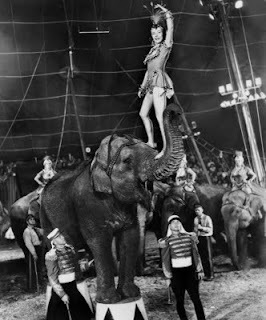 GrandOldMovies will have a GrandOldTime enjoying the pleasures of "The Greatest Show on Earth". I keep wishing "Around the World in 80 Days" wasn't the snoozefest it is, but wishes do not make it so. Luckily, we can see all those stars in much better pictures, and can enjoy Victor Young's music without watching the movie. Well, Ivan, now that we've set the Oscar world to rights it is time to turn our attention to Becky. After all, it's for her own good. Funny thing is that as I read her latest posts she's starting to sound like Dana Wynter from "Invasion of the Body Snatchers". Becky: "I can't do it, I can't, can't, can't go on." We just have to wait for her to fall asleep. Guys I have to watch you make Becks watch Car 54. I say lets send her to Boom Boom Land with Jan Berry ,maybe Errol will show up Boy Am I going to hesr about this. Becks Bow Wow Wow,"
Ooh! Ooh! Becky, don't freak out, but now that Vinnie has shown me episodes of CAR 54, WHERE ARE YOU? on Me-TV, it's really been growing on me! (Admittedly, it's even funnier when it's seen on late-night TV. :-)) The plots are intricately and marvelously insane! Getting back to THE GREATEST SHOW ON EARTH, I kept meaning to chime in about DeMille's hilarious remark to Desi Arnaz about pregnant Lucille Ball having to bow out of ...SHOW...! Dorian, did you ever think you would be a secret weapon? Surely, if anyone can do it, you can convince Becky of the error of her ways. It's true. DeMille left one of the most perfect Hollywood quotes of all time concerning Lucy's condition. Dorian! "We accept you, one of us! Gooble Gobble!" I love it! Go TeamBart! And I'm still guffawing over the Invasion of the Body Snatchers reference courtesy of Our Lady of Great Caftan. Beckers' new nickname is "ClassicBecky Driscoll" around Rancho Yesteryear. POD PEOPLE! I'm surounded by Pod People! You're not my Uncle Paul! Dorian!! They got you too.... I shall not be moved! -- Oh, Miles, I'm so tired..so tired...Somebody get me some speed!! OMG! If laughter is the best medicine, I have just been inoculated against every disease known to mankind. I can't stop laughing. Becky, I let the whole Chester/Festus thing slide. You gotta give in on this. You just gotta! Oh, my sides hurt. Oh. You Poor Pitiful Persistent Pod People -- I do not have Me-TV or any channel that shows Car 54, so you cannot win. It is entirely possible I may end up being the last human woman on earth - (I'll just move in with the last man, Vincent Price). Oooh! Oooh! I do not have Me-TV or any channel that shows Car 54, so you cannot win. But how do you know that I didn't sneak an episode in among those episodes of Thriller I sent you? (Diabolical laughter...not to mention diabolical acting) Rah-ha-ha-ha-ha-ha-ha-ha-ha! Hey, Caftan Woman and company, what do you say we all chip in for a TV and cable service for Becky? :-) Only half kidding; I'd pony up for cable for it if I had the resources! The Borg?! Poor, sick, sick pod people. Especially you, PodIvan! Now I'll be afraid to watch those episodes! You probably put subliminal messages in all of them -- "You vill vatch Car 54 and you vill like it!" CW, this has to be a record. This is comment #69! CMBA should have a bonus CiMBA for you! Becky, the true reward will come when you sing the Brotherhood song with the men of the 53rd! Java Bean Rush, I hear you. The boistrous Betty is not to everyone's taste. However, you do get plenty of distractions in the rest of the movie. HI Caftan Woman ... Sorry it took me so long to get to this. I now feel guilty about not liking this film! Classicfilmboy, there's plenty of guilt to go around! How do you feel about "Car 54, Where Are You?"? Well, I'll give you a pass on "Car 54"...for the time being. The world is divided into two types of people, those who revere Nat Hiken and "Car 54, Where Are You?" and Classic Becky! Bwahahahahaha. Damn it, C.W. -- orange juice burns when it comes out of a person's nose! OMG CW, you are just to much . I love it Not sure Classic Becky (AKA Becks) will. I live in hope we'll wear her down. At least make her a fan of one or two episodes. That's not asking too much, is it?